This post was written for inclusion in Bilingual for Fun's Blogging Carnival on Bilingualism, hosted this month by Spanglish Baby. Check back at Spanglish Baby for the carnival when it posts Feb. 25! I forgot just how chubby he used to be. Check out those excellent arm grooves! As I mentioned in "Two-year-old's favorite books: Bus & bear, flaps & flights," sometimes I cheat by making my own bilingual books. See, it's hard to find German-English books on the cheap when you live in the US (or, I imagine, other non-German-speaking countries), and the library has only a small selection available in each age range. If the minority language in your house is, say, Spanish when you live in the US or French when you live in Canada, it will likely be easy to round up quite a few options for bilingual reading time. But if you're stuck with a less trendy second language for your region — and you don't have unlimited book-buying funds — you have to make do. The way I've done it with my baby and now toddler is by finding English books that are simple enough for me, a non-native German speaker, to translate into German on the fly. He doesn't know that I'm not reading what's on the page, and I have a fun way to insert the minority language into our reading time. Now, sure, this technique works only on beginners in the target language, and it doesn't reinforce visual reading skills. Plus, it's fun to read actual German children's books to Mikko. So I'm compiling tips for a future post about how you can gather some bilingual books on a budget. They should be readily available to you in a typical English-speaking country, at the bookstore as well as at the library. They might be on your very own bookshelf at this moment! They should be entertaining to your young'un (baby to preschool age, or theoretically a beginning learner who's older). And they should be uncomplicated enough in grammar and vocabulary that even we non-native speakers can translate as we go. If you aren't strong in the minority language, you can review the books beforehand and visit an online bilingual dictionary. If you wanted, you could even scribble your translations into the margins, or cover up the English words entirely with your own labels. 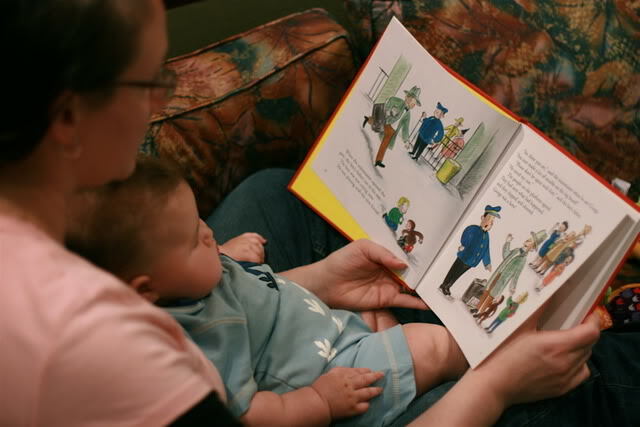 These tips can also work for parents using baby sign language with their infants or toddlers (or using American Sign Language as a minority language), because it's equally hard to find sign-language storybooks for kids. I've seen a few out there, but it's not something you come across at every corner. 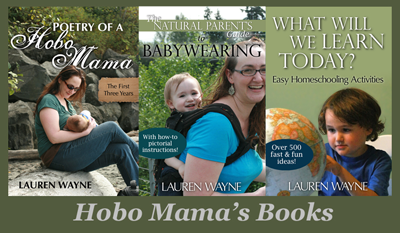 These books below are simple enough for even novice signers (like me!) to throw in what they know, same as non-native bilingual speakers (like me!). I mentioned this one in my other article, but it bears repeating. 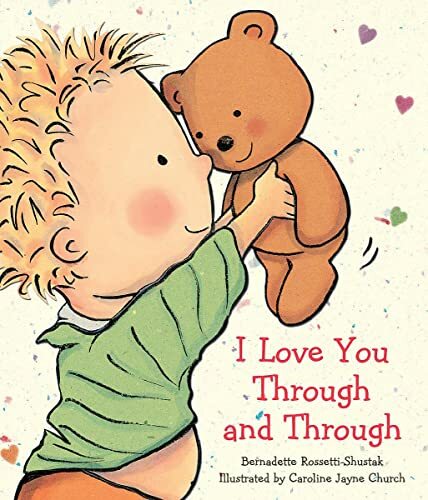 I Love You Through And Through, by Bernadette Rosetti-Shustak, is a simple board book with charming illustrations by Caroline Jayne Church and a lovely message: that you love every side of your child: silly side, mad side, top side, bottom side, giggles and cries, hair and toes. That should give you an idea of the kind of vocabulary you need at your disposal to render the words into your target language. Getting the grammar to scan in your language might require a little maneuvering, but since each page has only a few words, it's easy enough to work around. An innovative type of activity book I came across at the consignment shop was the books Dress Little Bunny and Play with Little Bunny , by Harriet Ziefert. (Used copies are up at Amazon for the astonishing deal of one cent (plus shipping), so you really can't go wrong.) 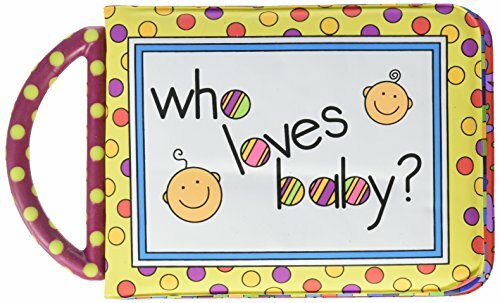 They are listed as "sticker books," but they're actually board books with static-cling vinyl film stickers, so they're all reusable (and rechargeable, by rubbing them against your clothing!). The pages show little bunny getting ready for some adventure and needing certain articles of clothing to complete her outfit, such as an umbrella and boots to walk in the rain. It gives practice with clothing vocabulary as well as coordination and logic practice for little ones. There's a lot in the way of animal vocabulary at our house, but Mikko seems to love it. 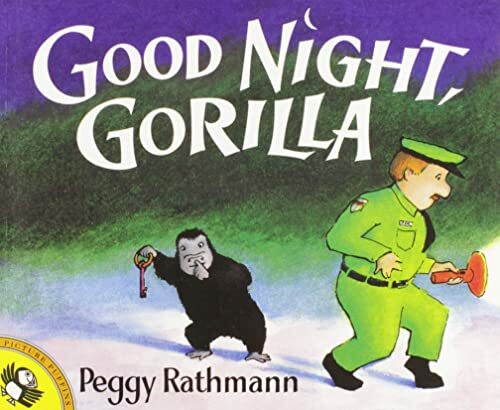 Another is a very cute children's book without much in the way of dialogue: Good Night, Gorilla, by Peggy Rathmann. All you need to know is how to say "good night" and then the names of an assortment of zoo animals. (If you're not a native speaker, you might need help with the likes of hyena and armadillo.) In English or in your target language, however, there's plenty more scope for conversation. Little eyes love to pick out the details on each page, like the mouse with a banana who follows the crafty gorilla, and you can describe the action taking place in the pictures. Mikko reading Blue Hat, Green Hat to himself at 15 weeks old. The kid's a genius. Or propped up by his blubber. One or the other. I've loved Big Dog...Little Dog, by P.D. Eastman, since I was a little puppy myself. I must admit, though, I cheat more with this one when I'm reading it in German. It works out, though, since Mikko's still very impatient with flipping pages, so I have to scale back the text in any case to match his pace. What's nice about Big Dog...Little Dog, as you might be able to guess from the title, is that it gives you lots of opportunity to practice opposites: big and little, fast and slow, red and green, wet and dry. Plus, who doesn't love a good story of opposites who make good friends? If you know a lot of food vocabulary, try The Very Hungry Caterpillar, by Eric Carle. If you don't mind more farmyard vocab, Family Farm (Ana's Animals), by Ana Larrañaga, has super-cute drawings and is currently up for grabs at 10 cents for a used copy at Amazon ! And if you want to cover emotions, try a book like Baby Faces, a varied series of close-up expressions by Margaret Miller. I have mixed feelings toward word books, without story to connect the vocabulary. I say mixed, because before having an actual child with whom to interact with them, I used to find them quite boring as a reader, but now I see how much delight Mikko takes in them. In fact, his favorite book for some time was First 100 Words, presumably because he could sign almost every one of those words. It was such a treat for him to point to a picture of say, a monkey, then sign it (scratch your armpits) and make an "eee, eee, eee" sound (that's what a monkey sounds like, natch), then wait for me to repeat it back to him and say "monkey" out loud several times to show I understood. ... Mikko goes ga-ga over the pages with trains, a recent obsession. He'll start saying "choo choo" and making the train sign (rubbing two fingers from each hand together) while I feverishly and obediently flip pages. Once I find the right one: "Train! Choo choo!" His joy is worth every hour spent poring over word books. So there you have it. 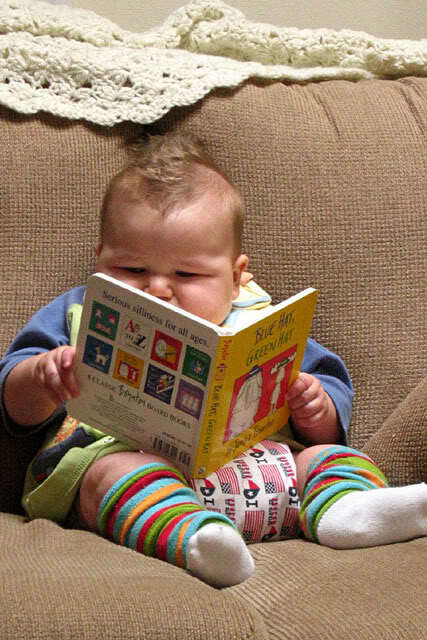 Despite all my sighing over picture dictionaries, they might just be the gateway to bilingual heaven for your baby. You can even make your own word book in your target language. Check out this tutorial on Muse of the Morning on making your own dictionary (via Alphabet-Garten). This is an especially good craft for a young elementary-school child who's learning to read and write, or you could create your own for a younger child. An easy book to make with materials on hand is a photo book of relatives. I've made a few of these for Mikko, using extra brag-book type photo albums I had around the house and prints I ordered online for the purpose. Since we live an extended distance away from our appropriately termed extended family, I wanted to make sure Mikko had a ready set of reminders of faces and names. This is super easy to translate, because all you have to know is the vocabulary of familial relations, such as grandmother, uncle, and cousin. Another good topic for a homemade photo flip book is daily activities, showing your child going through the routine tasks of the day. You might make a special effort to photograph each step, such as getting dressed, brushing teeth, going to a playdate, eating lunch, etc., and then placing the prints in order, or maybe arranged by days. That would be a good way to go over daily vocabulary in your target language (or, again, in baby sign language) and also emphasize your routines, which many young kids find comforting. I hope that helps give you some ideas for easy, cheat-cheat-never-beat bilingual reading. Look around your shelves or your library for other simple books that will work in the same way, and let me know if you come across other good options! 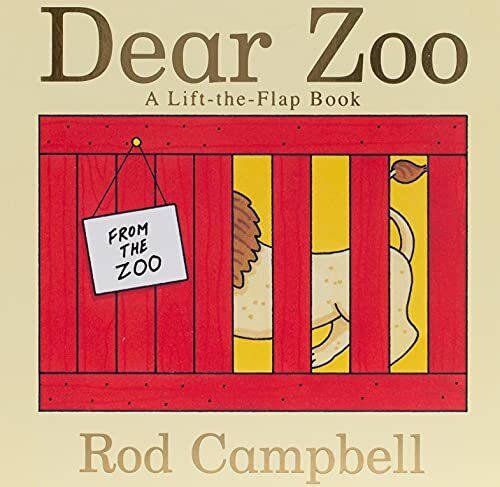 amazon.com often runs great deals on children's books & has a pretty decent selection of foreign language books. i love amazon because you never pay tax & if you spend $25 (if you buy only from amazon - none of their outside sellers), you get free shipping. i love reading your blog. thanks for keeping us informed! Thanks, Lauren! I will definitely include Amazon in my list, then! It's so nice to have the internet, isn't it? It's funny, but I actually do have to pay sales tax, because I live in the state they're located in. Sigh. But I still shop from them, anyway, and always try for the free shipping. I'll mention that you can buy from Marketplace sellers and get Super Saver Shipping if their items are fulfilled through Amazon. I know this, because I'm a Marketplace seller who uses that service! :) It's a nice way to get cheaper deals on some items. I had no idea that you were one of their sellers. I'll have to check out your shop! i love that picture of mikko propped up being a genius!! thanks for all the recommendations. we have excellent luck finding bilingual books at our 1/2 price book stores in the area too. Great tips! I am lucky that I can find a ton of Spanish books at our library but I sometimes have to translate books from English if they aren't available. I just wanted to add that you can take this a bit farther and instead of translating on the fly, which works well for simple books, you could actually translate the book and pasting the translation into the pages either over the English or next to it. It worked great for me with The Cat in the Hat. Working out the rhymes was a bit tough, good thing my brother is very gifted. Yet, rhymes are essential in many children's books. It may be worth it to do with great books that will quickly become child favorites in the target language.